What’s so darn cool about On-Demand Video? A brand new lesson is released to your inbox each week! Pause, rewind, fast-forward – it’s up to you! Access to personalized Dashboard containing all coursework, homework, videos and more! Take the class in your PJ’s if you like! 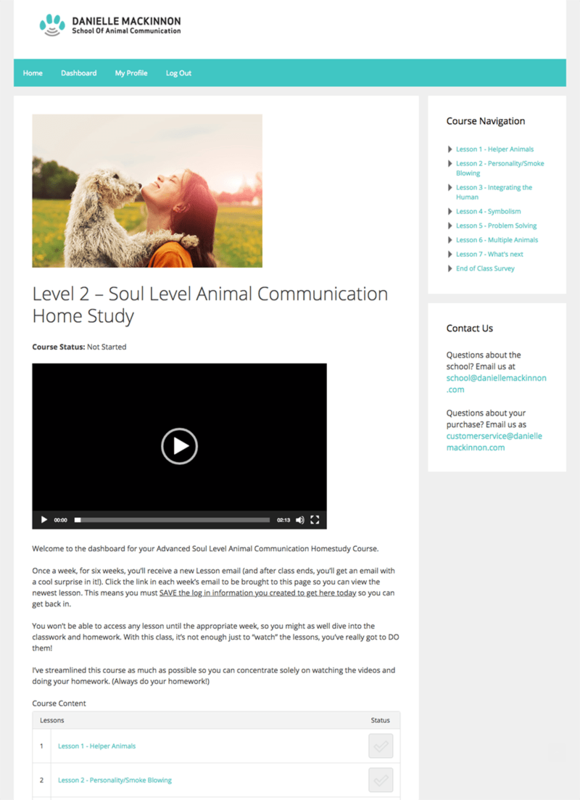 CALLING ALL ANIMAL COMMUNICATION STUDENTS! In this 6-week course, Danielle will teach you how to take your skills to the next level! You’ll learn how to communicate with animals with more confidence and have the tools in hand to handle the more complex situations. This unique program is designed for students who align with working at the Soul Level with animals and humans. 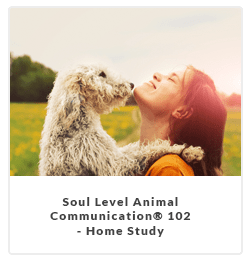 This advanced program is as much about YOU personally as it is about the animals you connect with. People who take their animal psychic skills to this level not only experience a higher level of work and connection with the animals they’re working with, but they also experience a positive shift deep within themselves. When you’re working at the higher levels with animals, sometimes you need to be able to pull in a little assistance. In this class you’ll learn about helper animals and how they work with you for the greatest good of both you and the animal. You’ll also see how fun helper animals can be! I’ll help you understand the nuances in an animal’s intuitive responses and how to handle those nuances by developing a deep understanding of exactly who this animal is. You’ll also learn the best ways to work with an animal that is smoke-blowing with my in-class discovery tool to learn what animal smoke-blowing is all about! In order to work at the deepest level as an animal intuitive, you have to bring the animal’s human into the reading. In this lesson, I’ll show you the exact steps to do that in the most effective and enjoyable way for all involved. I’ll lead you through a human/animal connection so that you can try it out on the fly! 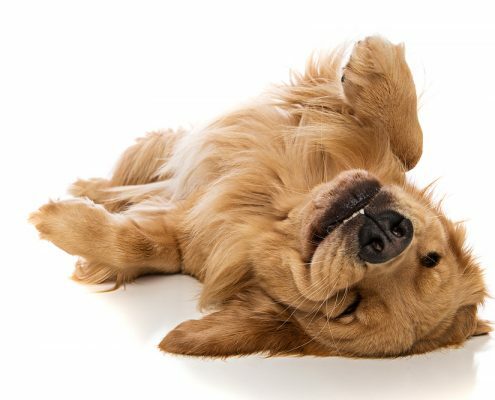 This is a technique you’ll be using throughout the rest of your animal intuitive career (whether it’s to work with your neighbor’s dog or it’s because you want to become a professional!). It’s time to learn your language! As your animal intuitive skills grow, so does the personalized language the animals will tap into in order to give you their messages. Here, I’ll teach you how to become aware of this very special language so that you can start developing your own thesaurus and move from simply stating what you receive from the animal into a place of understanding through translation! Many people have challenges with the animals they love and they’ll want YOU to help them fix the problems. In this lesson, you’ll learn exactly what “fixing” a problem in the animal intuitive world means – AND you’ll learn how to do it. Wouldn’t it be cool to be able to work with both of your neighbor’s dogs at the same time to find an answer? In this lesson, I’ll show you how to organize your energy and your intuition so you can most effectively manage working with more than one animal at a time. Once you master the technique, you’ll be able to connect with a handful at once – with no problem! At the Danielle MacKinnon School, we offer a money-back guarantee within 5 days of the first lesson if you are not inclined to continue. Just email us in that time frame to let us know!